Wayne State Police Sergeant Collin Rose passed away at 5:30pm on Wednesday, November 23rd due to a gunshot wound sustained while on duty. Sergeant Collin Rose was a 5 year veteran of the Wayne State Police Department, and was an experienced and dedicated K9 officer. Sgt. Rose was engaged to be married, and was very close to completing his master's degree. Sgt. Rose was a impeccably brave and selfless public defender, whose service to the Detroit community will be cherished and appreciated forever. The funds accumulated through this fund will be used to assist in paying for Sgt. Rose's memorial services, organizational donations, and any outstanding debts or services Sgt. Rose may have been paying. Donated funds will be directly withdrawn by Sgt. Rose's fiancée, Nicole Salgot. Ms. Salgot will be responsible in allocating these funds in a way that honors her memory of Sgt. Rose, as well the Rose family and his fellow officers. The funds accumulated through this fund will be used to assist in paying for Sgt. Rose's memorial services and organizational donations. Donated funds will be directly withdrawn by Sgt. Rose's fiancée, Nicole Salgot. Ms. Salgot will be responsible in allocating these funds in a way that honors her memory of Sgt. Rose, as well the Rose family and his fellow officers. 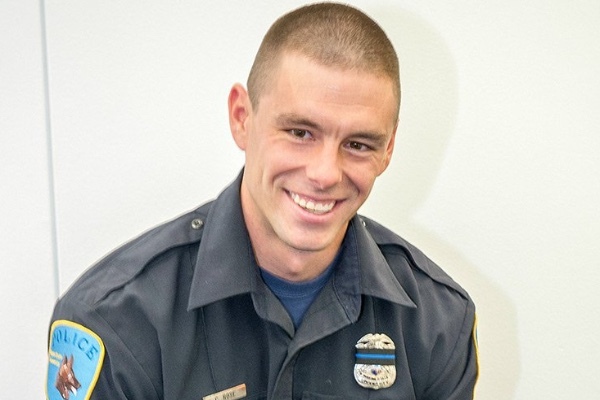 Show your support for Detroit Dog Rescue and Officer Collin Rose and his family by coming to Tony V's tavern between 4:00pm-10:00pm for a 50/50, silent auction, food, cash bar, and display of support for Officer Rose's family and fellow officers. Wayne State is accepting gifts in Officer Rose's honor. Please consider donating, as Officer Rose dedicated himself to protecting those who attend Wayne State and who live in the city of Detroit. Folks, now that we've left a donation to his family, let's please put a thin blue line on your vehicle, until we show that the love for our officers exceeds the hate and divisiveness of some groups who are endangering our police family. You can use stickers, blue painting tape, electrical tape - but let's remind America just how much we appreciate what these fine Americans do for us everyday. I don't even know what to say. This just should not have happened. Its hard to have faith in humanity. I fear the world my children are going to have to live in. Prayers to the familes and friends! Debbie I got the link for this off the official page for the school he worked for. If you aren't comfortable with this- theres an address on the schools page to send a check thatll get to his fiancé. People need to stop killing cops. I'm waiting for the day this happens, and someone nearby is also armed and defends the cop. That person should get a medal. Is there a way to confirm this fund is legitimate? And going directly to Collins' finance? No disrespect. Just really needing assurance this is fund is going directly to the source, as intended. This is so horrible. Prayers for the family during this very difficult time. Officer Rose was about to graduate and receive his Master's degree from the Dispute Resolution program at Wayne State University. He was known by colleagues in that program. He was strong and sensitive, brave and thoughtful, courageous and caring. May Officer Rose's visionary spirit and values invested in learning these tools and also creating new programs for finding that space bridging police and community proactively, with the intent on bypassing the violence be remembered and honored. I hope there may be in the future a scholarship in his name for police officers and criminal justice students to also study Dispute Resolution. Heartfelt condolences to his fiancé, friends and entire family, and all WSU Police Officers and those who serve and protect within this public duty. May we strive for developing and supporting new leaders who may carry on in the best of these characteristics of Officer Rose. Debbie, There are many close friends, colleagues, and family members that are well aware of this fund. There is nothing to worry about being that his law enforcement family will make sure there will be no misappropriation of these funds. I understand your concern but in this instance there is nothing to worry about. Will Brent Steinaker be willing to give the State Police DNA samples? Officer Collin Rose was a great friend to many and cared for all. For hundreds of nights I walk from lab to my apartment and see WSUPD officers patrolling around Warren and Anthony Wayne Drive. I always feel warm and grateful but never had a chance talking to them to say thank you. In the U.S. the police officers really risk their life to protect people that they don't even know. Thank you WSUPD. My condolences.